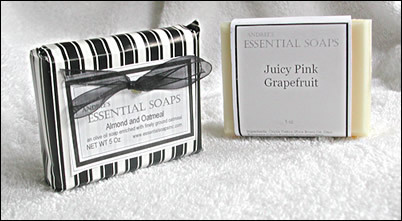 Andree's Essential Soaps largest assortment of spa products packaged in a large wicker breakfast tray for special gift giving. 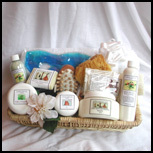 A luxurious terry cloth covered neck roll bath pillow is surrounded by a variety of moisturizers and bath products including the Cleansing Body Scrub, Shea Souffle, mineral and sea salt Bath Salts, decorative Luxury Soaps, Bath and Shower Gels,a sea sponge,and massager and bath brushes. An oriental silk brocade journal is included for recording the special spa dreams of the lucky recipient of this gift... All enhanced with silk flowers and professionally shrink wrapped and bowed for a spectacular dream gift!